The other morning at the market, I was kicking myself for not bringing my camera, but at the same time, feeling like maybe it was the right thing to do. The market, my market, on the quai St. Antoine, was simply clogged with people. Rightfully so. The more I cover all of the markets of Lyon, the more I come to adore my home base. What was new at the market this weekend? Well, the herbs are coming out, and beginning to look absolutely gorgeous. New potatoes from the region were hot and moving, the fresh young green garlic shoots as well as the huge juicy odorous stacks of ail rose were stacked in fresh formations, making me look forward to our time down south with Loic's parents. Since we have entered France's spring vacation season, it's a special time too because there are a whole lot of replacement vendors with interesting novelties to sell. Unfortunately many of them set their stands too close, not understanding Sunday, causing human traffic jams. But we can forgive them. We look up to the wind blowing in the plane trees, the pollen wafting about. We enjoy the sun on our faces, and remember not long ago when it was positively cold along the riverside. We cherish a word with our regular vendors and producers as we wait patiently for a family with a stroller to rearrange their purchases and say hello to their neighbors. My volailler has been recently featured in the local paper, nearly 60 years on the quai St. Antoine. City strangers push through, pretending to be locals and exasperated by the crowd. Excuse me sir, to you have somewhere to be, a pressing appointment? What are you doing here? All in good time, we move along. Life is good. The man who grows oregano (the only one in town, I think), sells very good eggs, and supplies me with verveine has a basket of nettles. Loic says "are you sure?" when I tell him I want some. Quick to bond with Loic, he ominously dons a suede glove and measures my portion. I ask if he has any fresh oregano yet, which goes very nicely with nettles, and he says: 'eleven days from now, madame. And how will you prepare the nettles? A soup?' I tell him I haven't decided. I wash and remove the leaves and tender young ends, wearing gloves, of course. 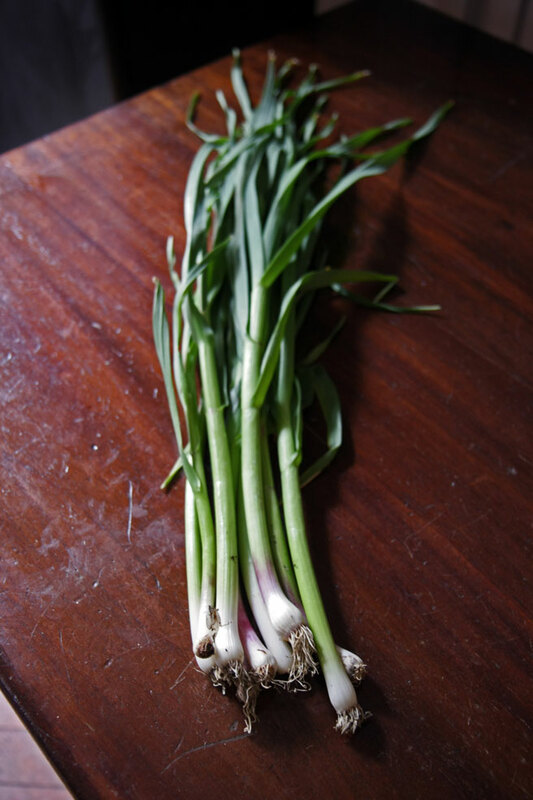 A bunch of fresh young green garlic is sliced and slowly sizzling in a mixture of olive oil and butter. I still haven't decided what to do with them, even as I begin to toss them with the hot garlic. That's the wonderful thing about nettles, you don't have to decide until late in the game. You can eat them simply sautéed, you can turn them into soup, a sauce, anything. One thing's for sure, you have to cook them or you'll get stung. I ended up turning them wilted and richly scented with spring garlic into a pastry shell, adding fresh sausage, herbs, drizzling them with a couple of eggs, topping the lot with some grated Comté and baking it like that. Spring in a shell. Thank you for posting this, especially the pictures of the nettles. I have recently read, A Woman in Berlin. Many of the entries talked of Berliners combing the streets and yards for nettles to eat. I had no idea what they looked like. I drink lots of strong nettle tea at this time of year when so much pollen drifts through the air. It keeps the sinuses dry and makes me feel so much better. I've just planted some so that I can have my own supply. I will try soup next! I have never had nettles but they sound really interesting. Nice photos! Oh lovely. I have never had them, but I'd sure like to try. I don't think I've ever seen them sold in the U.S. Are they very weedy as garden plants? I could try a small patch. Lyon sounds fantastic right now... If I only had the money to hop on a jet! I had not read your blog for a while. What a joy and inspiration. Thank you so much. Thanks for your comment about your experience with nettles in SF, Ora! suburbanbrunette, I'll have to see if I can get that book. I am always looking for good things to read. 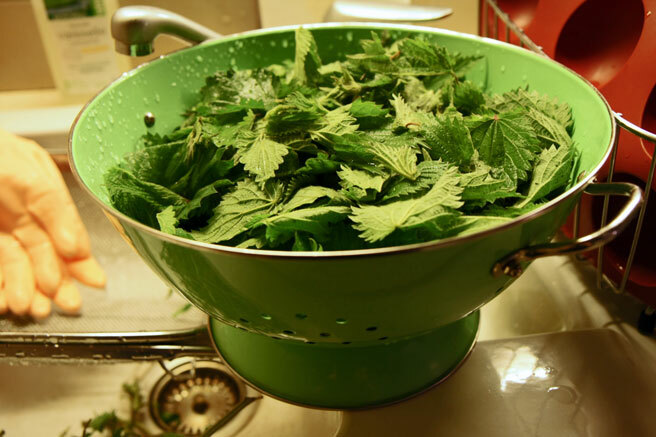 jzr, I had no idea that nettles were good for allergies, I just thought they tasted good! How interesting. Kevin, keep your eye out, people have been finding them in the parks. David, I think flatbread is just the thing and that's what I'm going to do next with them. Kitt, I don't know, but you should ask around at your farmers market. Someone might have a private stash! Dear Amanda and anonymous, I am happy that you're enjoying the blog, and hope you come by again soon. Oh, we eat nettles all the time and i use them to make rennet for cheese making. Baby loves to eat them and just yesterday we had gnocchi with nettle pesto. I always love your photos to go with your stories. feel free to come and pick as many as you want! I love 'spring in a shell'! 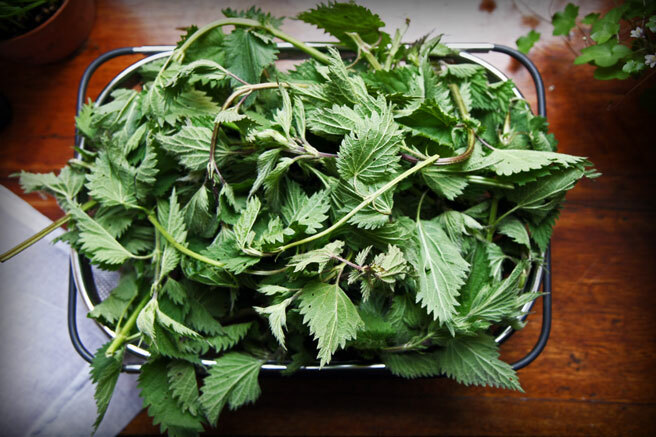 Wow, you can eat nettles? Do I sound like a dunce? I didn't realize, my Mama knew all sorts of things we could eat from the yard but I don't ever recall anything about nettles (Maybe they didn't grow near us). I have heard of nettles but usually in relation to rashes or something, this has been a really fascinating post. I had to pop over to Google right away and look up info on them. Very interesting, love your photos!! I just remembered where I heard tell of Nettles before, it was a fairy tale, where the sister had to weave 7 sweaters made of nettles for her brothers who were turned in to swans. I really enjoy this site, for me there is nothing more fun than going to the farmers market, and it's a real thrill to see what the markets in france are like. Beautiful pics! lucy, i have never come across such good food photography before - i feel i am in the photo, seeing smelling, tasting the food right there with you. i've added a link to your site on my own food page. I'm so glad I discovered your blog! I am enjoying scrolling through your delicious recipes, beautiful photos, and thoughtful writing. 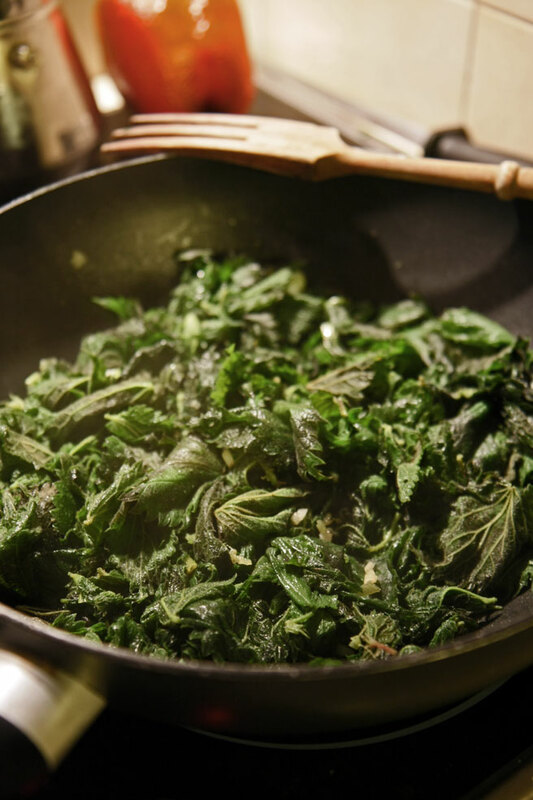 I grew up with nettles growing wild in my backyard and had heard that they were edible but now I wish I had taken the opportunity to experiment while I had it. You make them sound very enticing! Suburbanbrunette and I had the same exact thoughts on A Woman In Berlin!!! Awesome book, btw. And I too kept wondering what a nettle looked and tasted like while reading it.